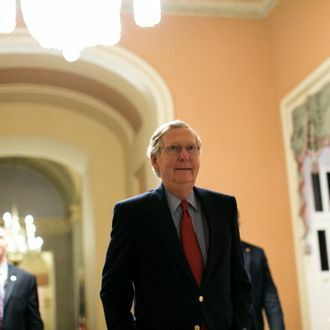 It took almost thirteen hours of voting on 101 proposed amendments, but the Senate passed its first budget in four years just before 5 a.m. on Saturday morning. (The final vote was 50-49, since four red-state Democrats voted no with the Republicans.) The $3.7 trillion budget would trim $1.85 trillion from the nation’s deficit over ten years with a combination of new tax revenues and spending cuts, but its chances of actually happening are about as good as that of the House’s recently passed, Paul Ryan-penned plan, which would balance the budget in a decade by severely decreasing spending on Medicaid, safety-net programs, and domestic agencies welfare programs to the tune of $4.6 trillion. That’s to say: not good, since a budget plan needs to be approved by both chambers to be signed into law. “We have presented very different visions for how our country should work and who it should work for,” Senate Budget Committee Chairman Patty Murray told the AP, “but I am hopeful that we can bridge this divide.” That sounds nice, but it’s difficult to imagine it happening in an environment where Senate Minority Leader Mitch McConnell (who strenuously objected to the plan’s “extreme policies”) takes to the Senate floor to “commend everyone” for participating in “one of the Senate’s finest days in recent history,” which, again, was marked by merely passing a budget that everyone knows won’t actually be enacted.